Heat oven to 400°F. Lightly spray 8 (8-oz) individual baking dishes (ramekins) with cooking spray. In 3-quart saucepan, heat oil. Cook potatoes, carrot, celery, onion and garlic over medium heat about 10 minutes, stirring occasionally, until vegetables are tender. Stir in soup, half-and-half, sherry, water, 1 teaspoon of the parsley, the poultry seasoning, chicken and peas; heat to boiling. Remove from heat. Cut 8 (4-inch) squares from puff pastry. Place ramekins on cookie sheet. Divide chicken mixture evenly among ramekins. 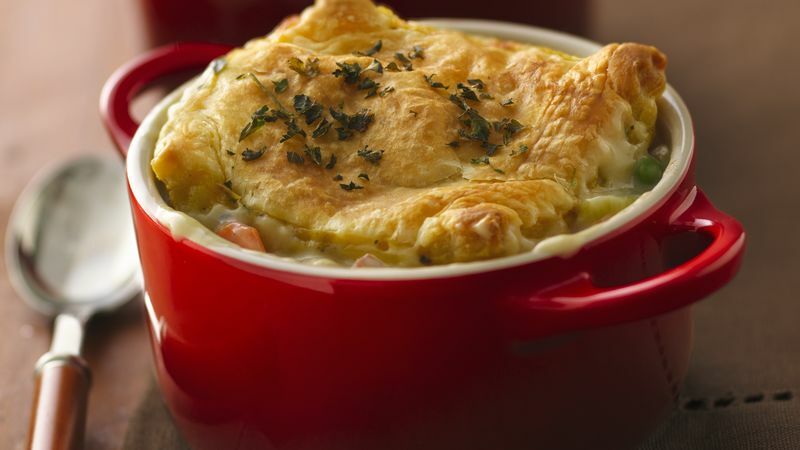 Top each ramekin with puff pastry square. Sprinkle with remaining 1/2 teaspoon parsley.